Matthew Armendariz, a shareholder of ScottHulse, is a real estate, business and finance attorney. An experienced lawyer, he advises clients on real estate, banking, lending, and finance as well as corporate and securities matters. His practice areas include Real Estate, Banking, Lending & Financial Institutions as well as Corporate & Securities. Mr. Armendariz’s practice focuses on real estate, including water rights, commercial lending and general business transactions in a variety of industries. Prior to joining ScottHulse, Mr. Armendariz was an associate in the finance practice group at the Dallas office of Vinson & Elkins L.L.P. There, his practice concentrated on a broad range of acquisition financing and commercial lending transactions including the representation of agent banks and commercial borrowers in connection with asset- and reserve-based financings within many different industries, including the upstream energy space. 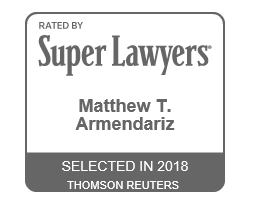 Mr. Armendariz was named a “Texas Rising Star” in 2017 by the Texas Super Lawyers and publishers of Texas Monthly and Law & Politics magazine. Mr. Armendariz is a member of the Texas Bar, as well as the American Bar Association and the Texas Young Lawyers Association. Mr. Armendariz earned his Doctor of Jurisprudence (J.D.) from Stanford Law School where he was an associate editor for the Journal of Civil Rights and Civil Liberties. He was also a member of the executive board of the Stanford Latino Law Students Association (SLLSA). He received a Bachelor of Arts in Philosophy from Yale University. Represented agent bank in connection with the documentation and negotiation of a $1.6 billion senior secured revolving credit facility for a publicly traded oil and gas exploration and production company based in Plano, Texas. Represented a publicly traded electronic device manufacturer in connection with the structuring and negotiation of a $225 million senior secured revolving line of credit to finance the acquisition of a microelectronics and fabless semiconductor company located in the United Kingdom. Represented agent bank in connection with a $750 million senior secured revolving line of credit for a private exploration and production company with large mineral holdings concentrated along the Gulf Coast in Louisiana, Alabama, and Mississippi and working interest in operated properties located in east Texas, north Louisiana, and central Louisiana. Represented borrower, an independent oil and gas exploration and production company based in Fort Worth, Texas, in connection with the negotiation of a $2 billion senior secured revolving credit facility with an unsecured toggle option. Represented a private oilfield water management and environmental solutions company in connection with a $300 million revolving line of credit with both U.S. and Canadian tranches. Represented a Denver-based midstream portfolio company of Morgan Stanley Private Equity in connection with the negotiation and structuring of an $80 million senior secured revolving line consisting of $50 million of initial commitments and a $30 million accordion feature. Represented a health foods portfolio company of a Dallas-based private equity firm in the documentation and negotiation of a $5 million working capital line of credit. Represented an over-the-road transportation/trucking company in connection with financing for several strategic acquisitions of companies based in Washington, Oregon, South Carolina, and Alabama.